scenarios, and this is what I have learnt. First of all, we should know the test pyramid concept that was developed by Mike Cohn, and described in his book Succeeding with Agile. 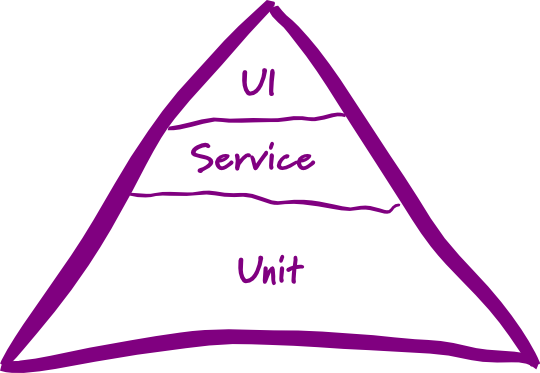 In a nutshell, the concept is about having many more low-level unit tests than high-level end-to-end UI tests. UI tests are brittle, expensive to write, and time consuming to run. So, the automation should lean much more towards unit tests. And the final base of checks is the low-level unit tests. any other types of tests. Unit tests should cover the bulk of your testing strategy. #2 Speed – Team should collectively decide the acceptable time for running the test suite, define it for all test types – unit, integration and acceptance. Create mocks for any external services that tests might be dependent on. #4 Debugging – When it fails, it should point broken code. Every object should be able to test itself. Write your code in such a way that typing a command should make the whole software system do a self-test. Also, practice Test Driven Development while working. This command will be run every time code is committed and pushed to Git develop branch. By running the test suite frequently, at least several times a day, you’re able to detect such bugs soon after they are introduced, so you can just look in the recent changes, which makes it much easier to find them. Build a testing culture where developers are naturally thinking about writing code and tests together. Do not over-automate. Only some tests should be automated. 1. If I automate this test, what manual tests will I lose (not be able to execute in the time given)? How many bugs might I lose with them? What will be their severity? 2. An automated test has a finite lifetime, during which it must recoup that additional cost. Is this test likely to die sooner or later? What events are likely to end it? require no changes to tests, only to the test library, thus, saving a lot of effort. 3. During its lifetime, how likely is this test to find additional bugs (beyond whatever bugs it found the first time it ran)? How does this uncertain benefit balance against the cost of automation? If those questions don’t suffice for a decision, other minor considerations might tip the balance. Note – The tests you need are often called task-driven tests, use-case tests, or scenario tests. Because scenario tests favor common tasks, they find the bugs most users will find. * Humans can notice bugs that automation ignores, especially GUI issues. * But, while humans are good at noticing oddities, they’re bad at painstaking or precise checking of results. * As humans can’t be precise about inputs, repeated runs of a manual test are often slightly different tests, which might lead to discovery of a support code bug. For example, people make mistakes, back out, and retry inputs, thus sometimes stumbling across interactions between error-handling code and the code under test. * Because test automation takes time, you often won’t report the first bugs back to the programmer as soon as you could in manual testing. * An automated test might not pay for itself until next release. A manual test will find any bugs it finds this release. Bugs found now might be worth more than bugs found next release. I have an awesome team of high performers. While I am proud of them, I want them to achieve more and be even better, and for that I have to learn how to be a good leader and a great teacher. So, I have been trying to get hold of books that would help me support my team. This book was already in my dad’s book shelf, so I decided to read this first. This book is written by Kenneth Blanchard along with Donald Carew and Eunice Parisi-Carew. The book was good (not awesome maybe, but good). I would rate it 3 out 5 stars. I did get to learn something new that I did not know about before. I came across the ‘Situational Leadership’ concept while reading the book. The situational leadership theory is a leadership theory originally developed by Paul Hersey, professor and author of the book ‘Situational Leader’, and Ken Blanchard, leadership guru and author of ‘The One Minute Manager’. What Situational Leadership means is that there is no single best style of leadership. The leader needs to change his/her style of leadership according to the current needs of the individual or team he/she is leading. The book talked about how we can use ‘Situational Leadership® II’ to help our teams become highly productive teams. Leaders need to provide varying combination of directive and supportive behaviours, according to the development stage the team is in. Different teams in different stages were described along with their leaders to help relate the theory better. I also came across the concept of PERFORM. 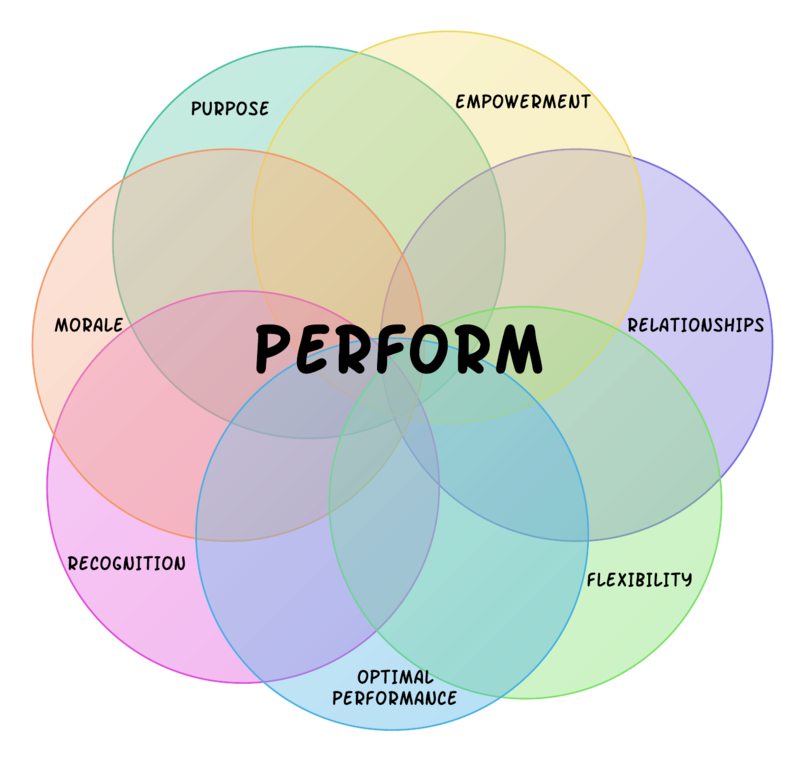 High performing teams show the characteristics defined under the acronym of PERFORM (There is a nice blog post regarding this here). The leader’s work is to help the team achieve these characteristics. – Communication & participation: who talks to whom? who is left out? who talks most often? – Conflict: how is conflict handled? 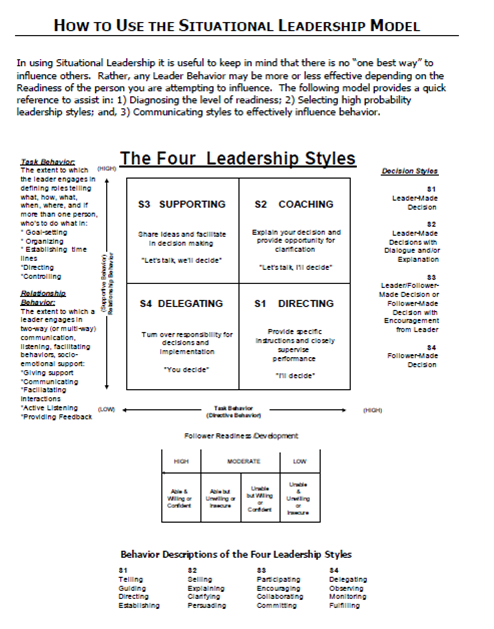 – Leadership: who is influencing whom? – Goals and roles: is the team clear about these? – Group norms: which norms (rules governing group’s behaviour) are most obvious in the group? – Problem solving: how does the group solve problems? – Climate/tone: feeling or tone of the group – how pleasant it seems. Once you get the hang of being a participant observer, it will be easy to diagnose the group’s functioning and development stage. Accordingly, the team leader adjusts the leadership style, and works towards empowering the team. A team leader’s most important function is to help the group move through the stages of development. 2. Try to move quickly from directive to coaching style (but in a gradual manner – step by step), and begin to encourage members to share their ideas and opinions. 4. Your job as a manager is to help people and teams develop so they have competence and commitment and the ability to share in making decisions. 6. The words “Manager” and “Educator” are synonymous. There is a movement being started to stop ISO 29119. If you are even a wee bit serious about your profession, you should be knowing about it. Here’s all about it. Read it if you want to know more, or just skip to the end and sign the petitions. James Christie gave a presentation in CAST 2014 on Standards – promoting quality or restricting competition? He talked about how some organizations are trying to enforce testing standards for their own economic gain, while victimizing the software testing profession. He also stated how the standards promote excessive documentation over actual testing, thus affecting the quality of testing by taking away time from the process. At a time, when we are trying to implement Agile, and moving towards exploratory testing, heavy documentation and rigid processes make no sense. And, to force it down the throats of everyone in this profession should not be tolerated. There is a reason why I have not taken the certification. Why should I pay so much money for something that won’t add any value to my work, except a bunch of words I might never need to use? I know this for a fact that being certified does not say anything about the tester’s expertise or potential. Most current certifications, for a fact, can be easily passed by rote learning. But, would that help? Rote learning never helps. How much do you remember of the history lessons from your high school? You did pass the exam. I have known many testers who are certified, but do not have a clue about testing, and are low performers. I have also known many testers, who are awesome at their work, have high potential, are high performers, and are not certified. That is why I ignore the certification status of people I interview, and instead focus on finding out myself about how much they are interested in testing, and how well they know their craft. “For several years when I was working as a test manager, I interviewed and hired numerous people. Once during an interview, a candidate pulled out a certificate and held it up for me, telling me he should be hired instantly due to his certification. I asked that he put the certificate away and talk with me. After discussion, it was my assessment that the candidate had little working understanding of how to test a product. Perhaps he had memorized material or had someone else take the exam for him – whatever had been the case; there was no evidence that the candidate would be able to perform well. As this event took place some years ago, I will refrain from trying to recall more specifics. If you read my blog, you will know I am not against learning. In fact, I am very passionate about learning. I keep reading books and blogs to learn more about my profession. But, I want to learn out of curiosity and interest, not out of fear. That is what this standard tries to instill – the fear of losing your job or validity as a software tester if you have not paid the bucks to get certified by rote. If the standard is accepted, companies will start believing that testers without a certification are not good, which is far from the truth. They will start over-depending on tester certifications to judge the quality of a tester. Iain McCowatt says “Standards in manufacturing make sense: the variability between two different widgets of the same type should be minimal, so acting in the same way each time a widget is produced is desirable. This does not apply to services, where demand is highly variable, or indeed in software, where every instance of demand is unique. Karen also explains this in detail in her blog where she says that the knowledge required by an e-commerce software tester, a BI software tester, and a Medical device tester are vastly different, and can not be covered by a generic testing certification. The testers would instead do better to learn more about their domain, and to get domain-specific knowledge. ISO 29119 claims that it is “an internationally-agreed set of standards for software testing”. But, it is not “internationally-agreed”. In fact, many influential software testers, and the experts that I look up to, are against it. I just finished reading this book. This is a very good book on usability. Everyone who is interested in improving their website, or in being a success in the Web domain, should read this. I wanted to write a summary for myself for the times when I am not having this book with me and want to recap the main points discussed, or for the time when I am in a hurry and just want a summary to go through before starting my work. So, here it goes..
1. Usability is mostly just common sense, but not necessarily obvious until after someone has pointed it out to you. * Pages should be self evident, etc. 5. It doesn’t matter how many times i have to click, as long as each click is a mindless, unambiguous choice. * How can I search? * What do they have here? * What can I do here? * Why should I be here – and not somewhere else? This one adds to my list of test cases for auto suggestion functionality. It really depends on the implementation whether this test applies or not, but it is still good to add to your check list. In our case, auto suggestions are displayed using keywords mapped to the record. There is one keyword for each word in a name. Example: “New Delhi” should show up as a suggestion when either “New” or “Delhi” is typed in. So, there are two records in database – one with “New” as a keyword, and one with “Delhi” as a keyword. But, what happens when words in a single name start similarly. For example, there is a city named “Tarn Taran”. Both words in the name start with “Tar”. When I type in “Tar”, both keywords “Tarn” and “Taran” will get matched, and if it’s not handled in the code, Auto-suggest list will display two records for “Tarn Taran”.